A competition which celebrates British Wildlife has announced its winners for the 2018 instalment and bats are the theme for the overall winner. The British Wildlife Photography Awards has announced the winners of the 2018 competition and the overall winner used an infrared camera to capture his winning image. 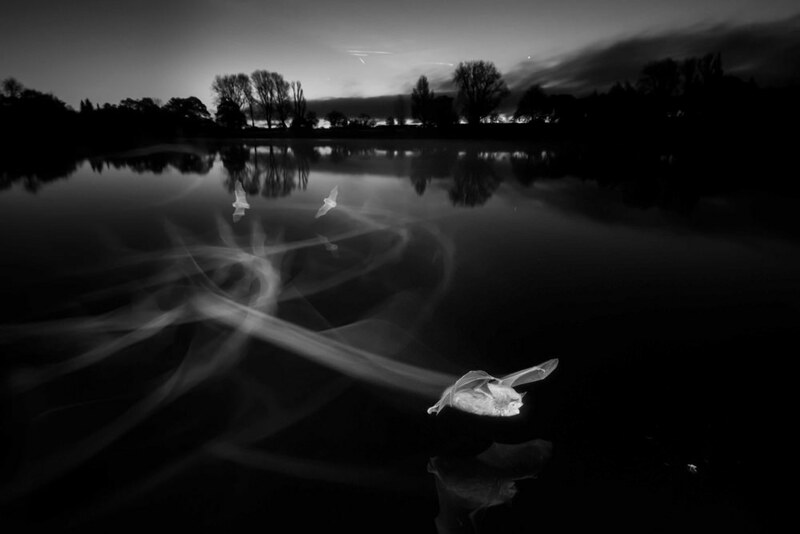 Paul Colley's in-camera double exposure caught the foreground bat milliseconds before insect intercept and it also shows the ghostly contrails that reveal the flight paths and wing beats of the Daubenton bats. As these bats are a protected species they were photographed in the wild following advice from the Bat Conservation Trust and Natural England. Commenting on his winning image, Paul said: "No other image in my portfolio had been so clearly conceived and yet so difficult to achieve. My artistic intent was to capture this extraordinary little bat’s speed of movement and hunting flight path, but the journey to success was littered with disappointing failures. Fortunately, fellow photographers encouraged imaginative experimentation and taught me to anticipate setbacks as a reasonable price for ultimate success. In hindsight, I experienced a huge gradient of emotion. There were the lows felt during months of long, cold and exhausting dusk-to-dawn sessions, sometimes waist deep in water and often without getting a single usable image. And then the natural highs of those light bulb moments, when new ideas blossomed, problems were solved and the project inched closer towards the potential to win this exceptional accolade." Naturalist, Author and Wildlife TV Producer Stephen Moss said: "Once again, this collection of images from the British Wildlife Photography Awards leaves us in awe of the skill, patience and artistry of the photographers whose work is showcased here. The extraordinary range of subjects, species and habitats, and the imaginative way they are portrayed leaves us in no doubt that we in Britain are fortunate to be home to some of the most talented photographers in the world. But stunning though this book is, it is not simply a collection of beautiful images, preserved like museum specimens for us to enjoy. It is also a snapshot of Britain’s diverse and beautiful wildlife, at a time when these wild creatures – and the places where they live – are under threat as never before." The awards celebrate both the work of amateur and professional photographers and the beauty and diversity of British wildlife. Winning images are chosen from thousands of entries in fifteen separate categories including a category for film and two junior categories to encourage young people to connect with nature through photography. For more information on the competition, and to see the full list of winners, visit the British Wildlife Photography Awards website where you can also learn more about the upcoming exhibition tour and book.